I recently had a chance to read a really good little book, Making Peace with the Land: God's Call to Reconcile with Creation, co-authored by Norman Wirzba and Fred Bahnson. Wirzba is a professor at my alma mater, Duke Divinity, where he teaches courses like "Caring for Creation" and "Food, Eating and the Life of Faith." Fred Bahnson is a writer, gardner, and cofounder of Anathoth Community Garden in Cedar Grove, NC. Occasionally the books seems to drift from its biblical moorings, but for the most part Making Peace with the Land is a really fascinating and compelling attempt to take seriously Paul's claim in Colossians 1:20, that "through him [Jesus] God was pleased to reconcile to himself all things, whether on earth or in heaven." God's work in Jesus wasn't just meant to reconcile humanity to God, but all created things. All things were made through him and for him (1:16), and so all things are reconciled by him too. Wirzba and Bahnson make this point early and spend the rest of the book trying to help us think about what that might mean for our relationship to the planet and to show us what that might look like in practice - how the ways we live might "proclaim the good news to the whole creation" (Mark 16:15). The ways these two draw out Paul's claim and the recommendations they make for Christian living in light of Paul's claim might surprise you, but it's a powerful message. If you really want to dig into, you'll have to check out the book for yourself. Today I just wanted to draw our attention to one part of the book that struck a chord with me. "Creation," he concludes, "exists for our health and nurture, but it is not made for our exclusive enjoyment"  - or, I would add, for our exclusive use. God created this world and everything in it, and he takes joy in what he made, cares for what he made. Unfortunately, our standard practices with modern, industrial agriculture (a topic the book focuses on) don't consider the world as God's creation. Instead, the world is viewed merely as a resource: it exists solely to fulfill whatever purposes we deem fit. From this perspective, it's much easier to lose sight of (or ignore) the harm our agricultural practices do to the soil, water, plants, animals, and ecosystems of a place. There are similar effects when we simply don't spend time in nature - holed up in our cities, busy with work, distracted with gadgets - and don't have to recognize or face the consequences of our constant pollution, littering, our landfills, or development. But we don't live in a world created to hold our trash or provide nice locations for our homes and roads. We live in a world created by God for his pleasure, a world he called good (Gen 1), a planet that both manifests his blessings and love (Ps 104:10-18, 27-30) and offers back praise to him (Ps 96:11-13). Given the ways we often think about the world, and given the ways the Bible often describes the world, it seems that Christians need to start thinking about creation differently. Maybe Bahnson and Wirzba are right, and when God "took the man and put him in the garden of Eden to till it and keep it" (Gen 2:15), that was "an invitation to know and share in God's love for the whole creation" [p. 18] - an invitation that Christians in the 21st century need to take very seriously. Today, April 22nd, is Earth Day. Christians haven't always seen this as a holiday for them, but we can, and we should. "The earth is the Lord's, and everything in it" (Ps 24:1). We need to stretch our imaginations so that we do think of the earth as the Lord's and Earth Day, when people emphasize our responsibility to care for the earth, as a properly Christian holiday. There's a lot of bad news. This morning our local paper reported that the police stopped a man from jumping off of the Mississippi River bridge yesterday afternoon. That news comes on the heels of a report from the weekend revealing that the suicide rate here in Adams County is 36% higher than the national average and 25% higher than the state average--15 in 100,000 deaths compared to 11 in 100,000 and 12 in 100,000, respectively. The newspaper named three factors in particular that fuel this situation: poverty, drugs, and lack of education. Of course the well-educated, upper or middle class individual who's not dogged by substance abuse will take his life too. The tragic news about Matthew Warren last week is evidence enough of that. And the other headlines today, obviously, are about the explosions in Boston yesterday. At this point, 3 people have died and scores have been injured and hospitalized. Someone poured out their malice and spite in one tremendous act of violence on people he probably didn't know, just lashing out at the world, at whomever he could reach. What do you say in the face of these things? What do you say to depression and despair, addiction and poverty, suicide and the survivors? What do you say to rage and violence, terror and murder--and the survivors? And not only in Natchez, in Boston, in the United States. What do you say to earthquakes in Iran and Pakistan? Or the bombings in Iraq on Monday, or the on-going violence in Syria, where a million people (500,000 children) have been displaced by the carnage? There's bad news, horrific, heart-breaking news, coming from all over the world. Every day. Constantly. What can you say to all of this? You want to look for solutions--counseling and medication for depression, education and aid for those in need of them, negotiations and peace after years of conflict. And sometimes 'solutions' really can solve things, though often they cannot. You want to offer comfort and sympathy to those left behind, those wracked with grief and questions, and those still in the middle of it all, still unsure, still hurting, still in danger. And sometimes a person can take comfort from our gestures and considerations, but often they cannot. We should work towards 'solutions' and strive to offer consolation to people who are suffering, but that's not all we can do--not even the best thing we can do. We should pray, "come, Lord Jesus!" Because that's when the healing comes. In Christ, our work here and now is not in vain, but the lives that are broken and bruised and torn that we work to treat now, then these lives will be made new, made whole. The fires of conflict and unrest are going to be dowsed with the waters from the spring of life. The forces of evil that infect our world today will be crushed beneath the throne of God that comes down from heaven when God comes to dwell with his people and wipe away their tears, when death and mourning and crying and pain will be no more. There's a day coming (and I really believe this) when all things will be made new, when all the bad news will be no more--it'll be replaced with good news. We work against the bad, work towards the good now, but only God can complete that work. So please, God. Come, Lord Jesus. This morning, continuing my slow trek through the book of Proverbs, I came upon a verse that's a little different, a little unusual. You expect sayings about the wise man and the fool or the clever and the simple, the fate of the righteous and the fate of the wicked--and much of the time, that's exactly what you get. But every now and then there's a welcome break in the pattern when Proverbs throws you a curveball. abundant crops come by the strength of the ox." First reaction: 'Oh cool, animals! Oxen'. Some proverbs are just hard to relate to, right? I don't raise any grain; I don't own any oxen. Sure, I guess if you lived in an agricultural society where you used oxen to cultivate the land, you need a strong ox. That makes sense. Oh! There's something about wisdom in verse 6.
abundant crops come by the strength of the [tractor/pesticide/fertilizer/genetically modified seed]." Over the last century, as we discovered that we could industrialize and develop enormous plots of land quickly, we ditched the beasts of burden. We can engineer seeds that grow into larger, hardier crops! 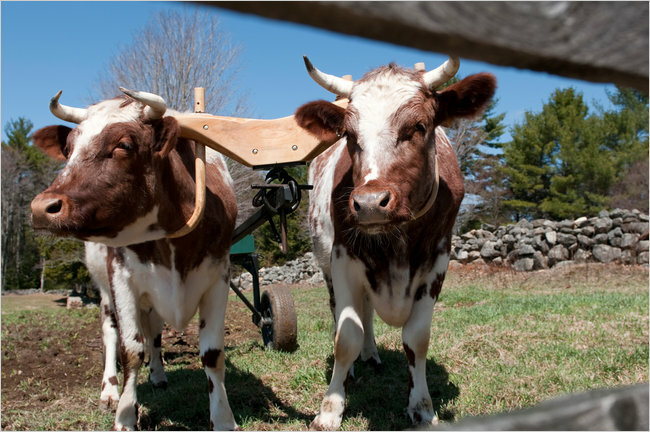 We don't need a team of oxen. The Bible's just a little... well, behind the times. And yet it seems like some folks are rediscovering the wisdom of Proverbs. In 2011 the New York Times reported that many small farmers in the US have (re)discovered the benefits of animals in recent years. As one farmer in the story pointed out, “Ox don’t need spare parts, and they don’t run on fossil fuels.” They run on grass, instead of diesel--and they leave free fertilizer behind them! And as heavy as these animals may be, they're nothing compared to tractors, aerating the soil where machinery would leave deep ruts. And those are only a few of the advantages. Of course there are disadvantages: they're slower than other methods--impractical for the huge fields we've grown accustomed to--and more temperamental than tractors. Yet with more and more voices insisting that our more conventional, industrial farming practices today are ecologically unsustainable and won't suffice to feeding the world's growing population, you have to wonder how important the drawbacks really are. Maybe Proverbs isn't behind the times at all. Maybe this is actually one of the most timely verses in the whole Bible. Maybe sometimes modern readers with all of our modern wisdom are a little too quick to re-write the scriptures.